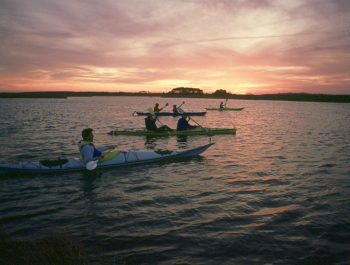 *minimum of 4 participants for this tour to go out as each tour requires 2 guides for safety during night time paddling. Kayaking during a full moon is a must do for any self-respecting paddler. This 1.5-2 hour excursion is a great way to enjoy the coastal environments, observe bioluminescence (glowing fluorescent bacteria in the water!!!!) and howl at the moon on a summer evening on the Outer Banks. 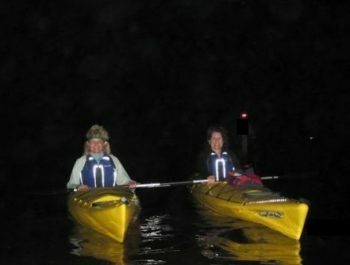 Full Moon and Bioluminescence Kayak Tours are one or the other, an NOT both. If there is a full moon it is too bright to observe the bioluminescence in the water, and if there is no moon, it is dark enough to observe the bioluminescence. Obviously due to Mother Nature’s lunar cycles this tour is only offered during a full moon and the summer months when the water temperature is warm enough to support the growth of the bacteria-producing bioluminescence.